I have been the owner of a bread maker for quite a few years now, however, for at least the past five years it has sat in a cupboard, alone and unloved. 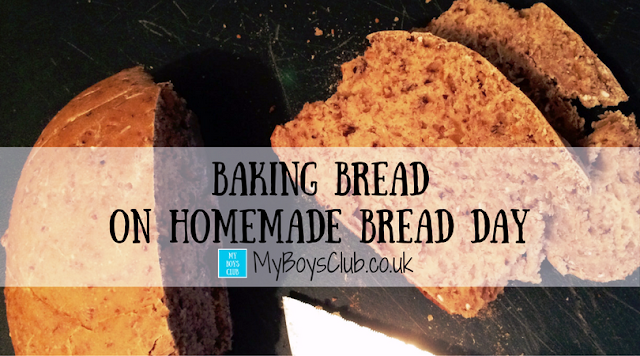 That all changed this summer, however, when I re-discovered my love for homemade bread, spurred on by the fact that my boys are quite happy to eat much nicer bread rather than white sliced. Thankfully the machine still worked! Now with today being, Homemade Bread Day, I thought there was no better day of the year to share with you, my rekindled passion for baking. Bread is one of the oldest prepared foods. It is an important staple food around the world, prepared by cooking a dough of flour and water and often additional ingredients too. In fact, baking was introduced as a respectable occupation for Romans around 300BC. It's no coincidence that it is often referred to as the staff of live - a basic food. But its name can also denote money too. The 1980s sitcom by Carla Lane about a family with little money was called Bread; a breadwinner is a person who earns money to support a household, its uncooked form dough is also synonymous with money. Breaking bread is to share with another and also often referred to in the bible. Home-baked bread is often healthier, higher in fibre and lower in salt and additives than commercial varieties, and it is easy to adapt recipes to personal tastes, with grains and spices etc. And the invention of the breadmaker has taken a lot of the effort out of baking too. I have been baking soda bread as a quick and easy accompaniment to homemade soup for a couple of years, but I decided it was time to venture back to bread. It is supposed to be buttermilk so we never have it so we just sour milk with lemon juice and that seems to work. Something I learnt just by googling it. We have added garlic, onion, and cheese as flavourings and it is perfect to dip in soup. The boys love it. We’ve even baked it in the convection oven that is part of the microwave and it works just fine. Now I have nothing against shop bought sliced bread. We always have a loaf or two in the freezer. It definitely saves time. I also love soda bread we make but there is nothing better than the yeasty, delicious aroma of bread baking in the oven. So today on Home-Made Bread Day I’m baking a few loaves. We like granary style bread the best so we’ll be following the instruction that comes with the machine to make bread – just like this one. You simply put the ingredients in the machine in the correct order and quantity, set the machine to the chosen program number and a few hours later you'll have fresh bread. There is even a delay timer function so that you can bake it overnight and wake up to a fresh bread smell in the morning wafting through your house. It doesn't matter if it doesn't come out perfect - this one is cracked across the top because it still tastes and smells so good. I'm certainly not going to be applying for The Great British Bake Off anytime soon or challenging Paul Hollywood for a presenting job! The boys now ask when is the bread machine going to be on. Today they should be very happy. Baking bread – what could be better. Nothing beats homemade bread does it? We occasionally make our own but I think we're going to try and do it more often in the coming weeks - we have a new food mixer and seem to have caught the baking bug! These sound so delicious, I especially like the sound of the first one. I'll definitely be trying it. Thanks for the recipe!